t11/lcdrange.h contains the LCDRange class definition. t11/lcdrange.cpp contains the LCDRange implementation. t11/cannon.h contains the CannonField class definition. t11/cannon.cpp contains the CannonField implementation. t11/main.cpp contains MyWidget and main. Calling this slot will make the cannon shoot if a shot is not in the air. This private slot is used to move the shot while it is in the air, using a QTimer. This private function paints the shot. This private function returns the shot's enclosing rectangle if one is in the air; otherwise the returned rectangle is undefined. These private variables contain information that describes the shot. The timerCount keeps track of the time passed since the shot was fired. The shoot_ang is the cannon angle and shoot_f is the cannon force when the shot was fired. We include the math library because we need the sin() and cos() functions. We initialize our new private variables and connect the QTimer::timeout() signal to our moveShot() slot. We'll move the shot every time the timer times out. This function shoots a shot unless a shot is in the air. The timerCount is reset to zero. The shoot_ang and shoot_f are set to the current cannon angle and force. Finally, we start the timer. moveShot() is the slot that moves the shot, called every 50 milliseconds when the QTimer fires. Its tasks are to compute the new position, repaint the screen with the shot in the new position, and if necessary, stop the timer. First we make a QRegion that holds the old shotRect(). A QRegion is capable of holding any sort of region, and we'll use it here to simplify the painting. ShotRect() returns the rectangle where the shot is now - it is explained in detail later. If the shot has moved beyond the right or bottom edge of the widget, we stop the timer or we add the new shotRect() to the QRegion. Finally, we repaint the QRegion. This will send a single paint event for just the one or two rectangles that need updating. The paint event function has been split in two since the previous chapter. Now we fetch the bounding rectangle of the region that needs painting, check whether it intersects either the cannon and/or the shot, and if necessary, call paintCannon() and/or paintShot(). We leave out the implementation of paintCannon(); it is the same as the paintEvent() from the previous chapter. The formula used is the classical Newtonian formula for frictionless movement in a gravity field. For simplicity, we've chosen to disregard any Einsteinian effects. We calculate the center point in a coordinate system where y coordinates increase upward. After we have calculated the center point, we construct a QRect with size 6x6 and move its center point to the point calculated above. In the same operation we convert the point into the widget's coordinate system (see The Coordinate System). The qRound() function is an inline function defined in qglobal.h (included by all other Qt header files). qRound() rounds a double to the closest integer. 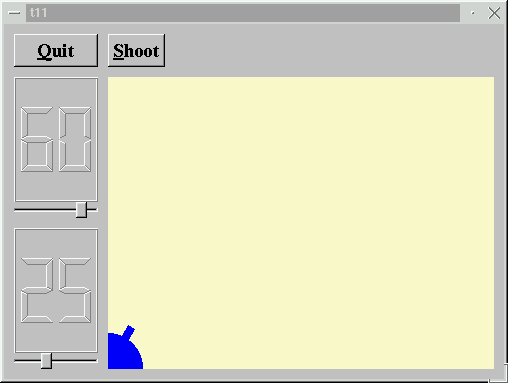 In the constructor we create and set up the Shoot button exactly like we did with the Quit button. Note that the first argument to the constructor is the button text, and the third is the widget's name. Make the shot a filled circle. Hint: QPainter::drawEllipse() may help. You're now ready for Chapter 12.